Aqua tape hair extensions system is one of the fastest ways to apply a full head of hair extensions on the market. No need for any additional tools or glues, only your hands and clips are needed. A full head of hair extensions can be applied in less than one hour. The tape hair extensions system is made with 100% human Remy hair (all cuticles are facing the same direction). This prevents the hair from tangling or looking old as long as the client maintains the care instructions. Our hair comes in 14” , 18″ & 22” inch long. Aqua Hair Extensions tape: • Made in the USA. • Pre cut and pre taped, no cutting or tape prep needed. • Very thin and flexible, the client will not feel the tape. • No need for additional glue or heat, unlike other companies. She has been with Kimberly at Indulge Salon, South for almost 30 years. She has super fine hair that just doesn’t behave in the humidity, falls flat as soon as she walks out the door and has difficulty growing her hair out without it looking thin on the ends and see-through like a veil. Charmaine has always kept the look of a bob and was getting tired of this look. She was ready for something more…. the expense. We discussed the AFTER care learning how to brush and comb her hair and when to tie it up at night. Can you color your hair with Aqua hair extensions? Yes, we as professional can do this for you and we highly recommend a consultation prior to the day you have them installed. 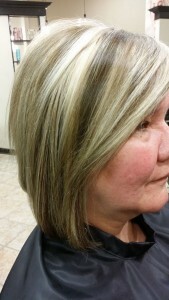 Most of our clients do enjoy highlights, permanent color on their hair. Permanent haircolor cannot be used on the Aqua hair extensions due to the 21 day process of dyes used on the Indian hair. We can use deposit only color that will deposit and not open the cuticle of the hair. Indulge Salon hairstylists are educated on these processes. If you color your extensions and run into a problem, we will try to give you a solution but we must tell you that we will not guarantee someone else’s work in another salon. We will only guarantee our work done in our salon. Double Drawn means that all of the hairs in the bundle are the same length from top to bottom. It takes almost 10 times the amount of hair to achieve this, since natural hair tapers. This level of quality allows you the flexibility of creating exactly the look you want. Remi hair is when the cuticle of the hair is intact, and facing in a natural downward direction. All of Aqua Hair Extensions are Remi and Double Drawn hair. 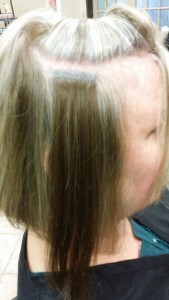 Hair extension adhesive (normally called glue or resin) is already applied to the tape in extension. We found the quality of this company uses an adhesive that has been tested amongst other competitors and use a special Keratin resin produced in Italy that has given far more superiority than other brands. For me as a salon owner and consumer, I want the very best quality for my clients. Some adhesives that I’ve tried over the years are made with plastic and were very difficult to remove. This is not the case with Aqua hair extensions. Within about 4-6 weeks we recommend that the hair extensions be removed and replaced again for longevity of the hair extensions. We will re-tape the extensions and reapply. Therefore, the extensions will be in your hair longer and you will not have to repurchase hair unless you would enjoy different colors added. We are able to customize colors. We use only safe Aqua remover to protect your hair and the hair extension hair without oils and unnecessary time that can come with some of the competing hair extension products. We recommend a boar bristle brush that glides with the hair. Pull the hair up to prevent tangling. Schedule regular appointments every 4-5 weeks to prevent any damage or weakening of your hair extensions that can easily be checked in minutes.